A small crane in the station area slowly rotates, following the direction in which the wind is blowing. 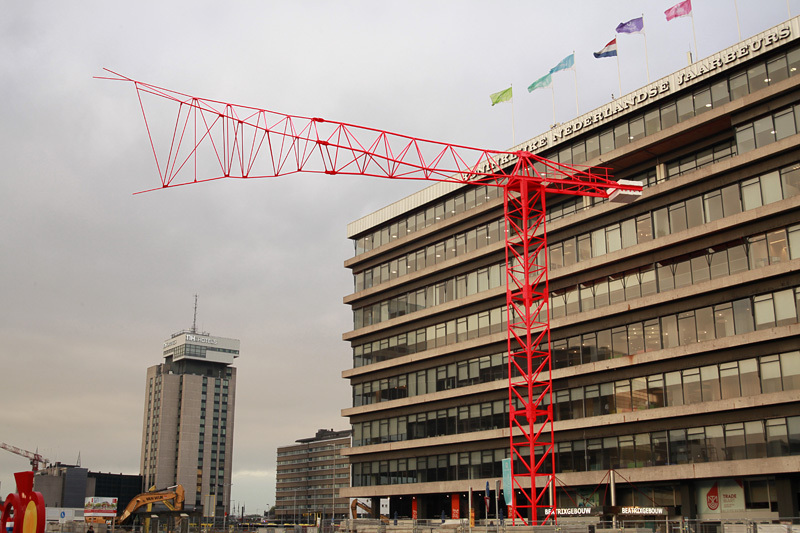 If you look long enough, it soon becomes apparent that the crane cannot do what cranes are designed to do: move building materials over the roof of houses or from one area of a building site to another. This tower crane ends in a thunderbolt-like shape, an almost organic drawing of lines, that suggest an unravelling. In an area so completely and totally under renovation, adorned with a skyline of tower cranes, this artwork of artist duo HeHe might be overlooked during daytime. The work just seems to be part of the building site and the ever-changing environment. But the crane's arm, which draws the background with its lightning shape, does not tell a story of construction, change and improvement but rather of explosion, degradation and a more savage, uncontrollable energy. 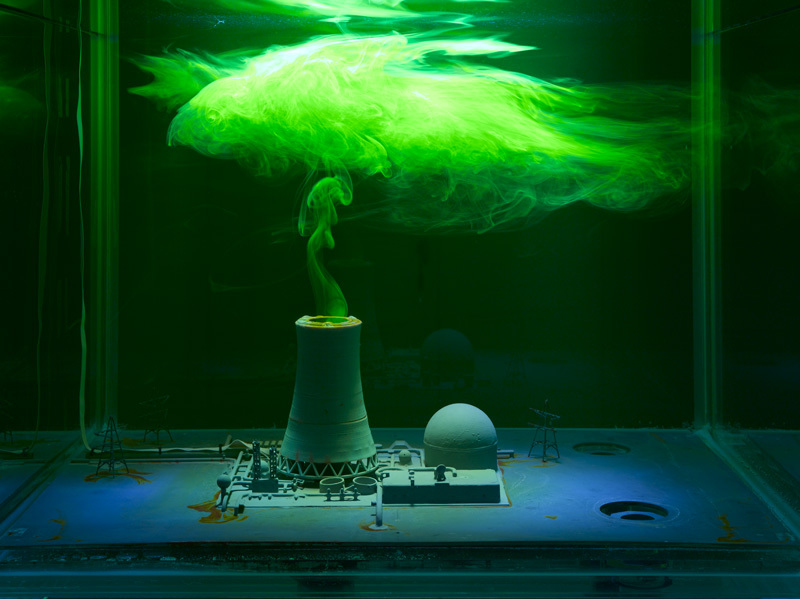 For Cape Farewell’s annual Lovelock Art Commission hosted by the Museum of Science and Industry, Manchester (MSI), HeHe have taken inspiration from James Lovelock's Gaia Theory and latest climate science funded by the Natural Environment Research Council (NERC). 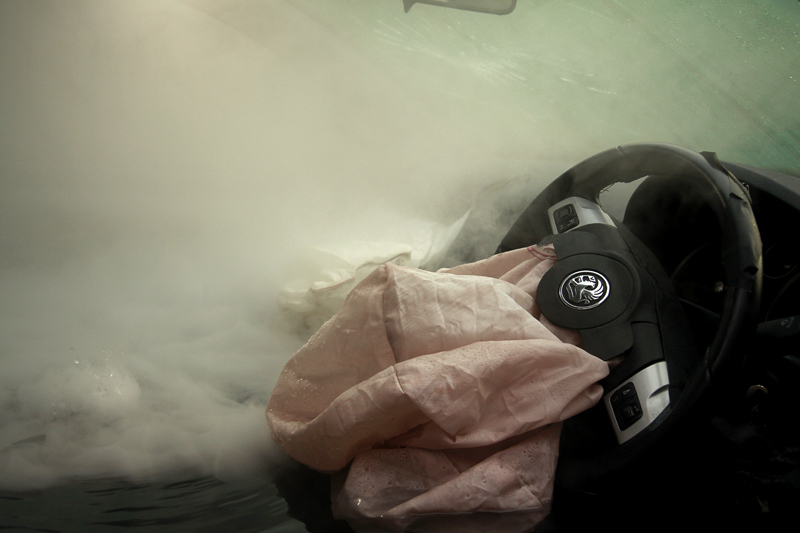 The Cloud Crash exhibition consists of three new art installations: Burn Out, Airbag and Diamonds in the Sky. Man-made clouds are blowing through the Manchester's industrial heritage site. Clouds occupy a special place for artists, their countless forms offering infinite possibilities for metaphor. For climate scientists, understanding how clouds regulate the Earth’s temperature is an expanding area of research. 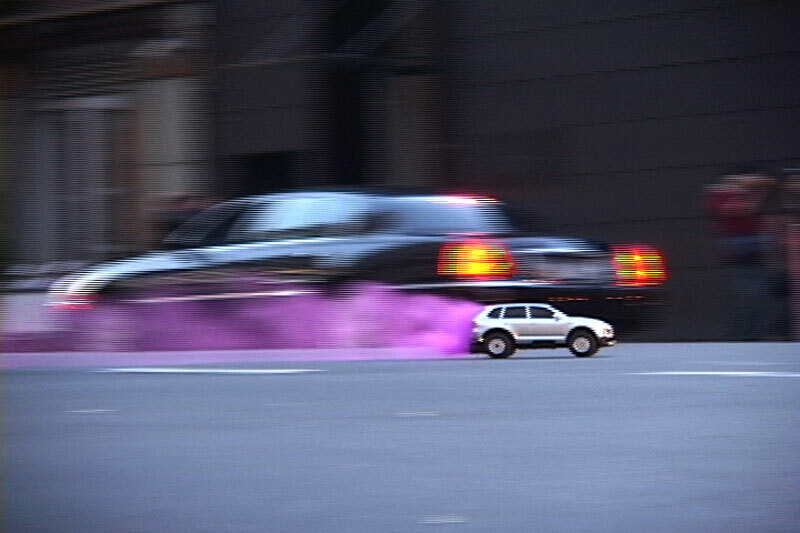 Through vehicle exhaust fumes, ozone gases and non-stop carbon emissions, human activity has an invisible impact on the atmosphere. The air we breathe is mingled with toxic smog, blurring the boundaries between natural and man-made clouds. Earth’s atmosphere is changing in such profound ways that the notion of pure natural clouds, untouched by mankind, belongs to a more innocent age. An aquarium containing a domestic globe, a motor to turn the globe and electronic valve or drip feed which releases a fluoresceine tracing dye onto the sphere. 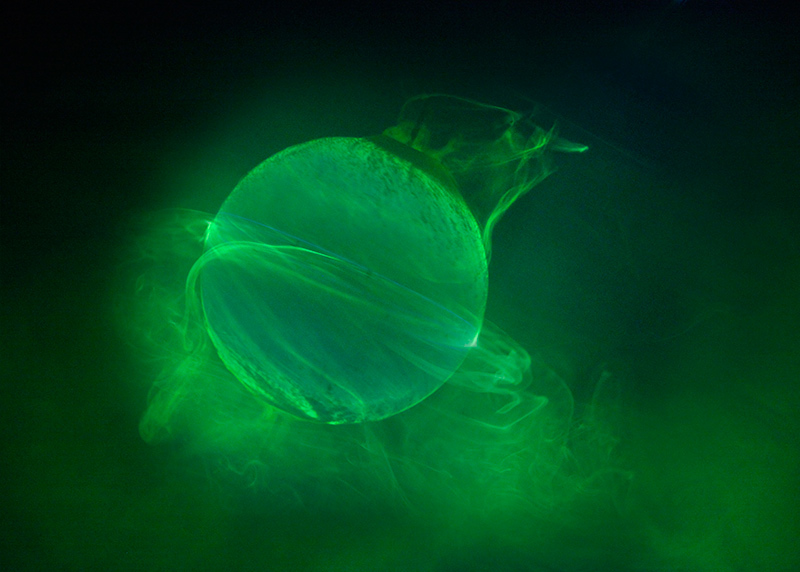 As the sphere turns, the green dye wraps itself around the sphere, enveloping it in what appears to be a thin gas or atmosphere that surrounds the planet Earth. The difference between emissions and atmosphere, the ‘man-influenced’ and the ‘natural’ climate cannot be easily defined. Exhibition at Wace-ArkaneAfrika in the green zone. every Thursday and Sunday at 9PM (Berlin, NY and Shanghai time). À l'occasion des trente ans de L'Artothèque, c’est une collection privée que celle-ci décide d'exposer pour cette fin d'année 2016. Sous le titre « J’ai des certitudes sur mes doutes », l’exposition réunit un ensemble de quelque 50 œuvres sélectionnées parmi celles passionnément collectées par leur propriétaire au cours des trente dernières années. Seven years ago, during a residency at Pollinaria, we began work on a humble little book about the perception of atmospheric pollution clouds. Since then the book has grown in length but at long last it is ready and in print! Many thanks to the many people who helped along the way and especially to guest authors Jens Hauser, Noortje Marres, Gunnar Schmidt, Malcom Miles and Jean-Marc Chomaz. 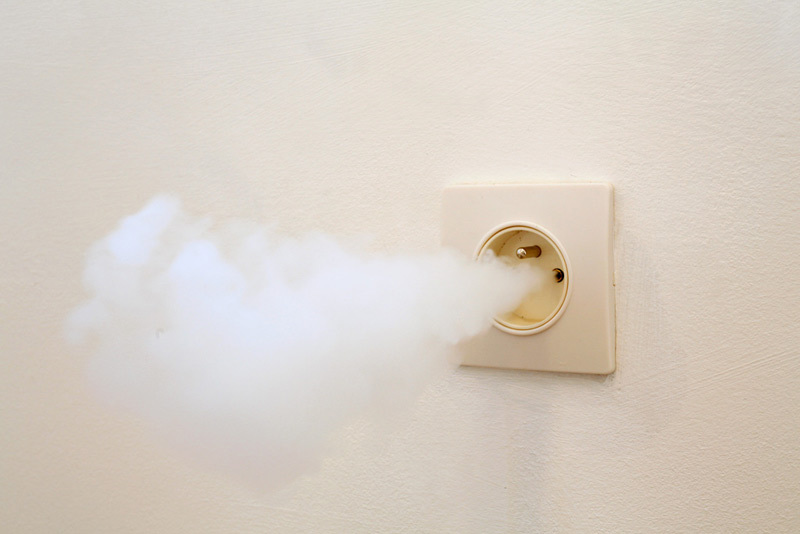 Edited by the artists, Man Made Clouds Clouds is based on a series of artistic interventions and a cultural analysis by six authors of atmospheric emissions. Natural clouds occupy a special place in our imaginations, their countless forms and meanings offer infinite possibilities for metaphor. 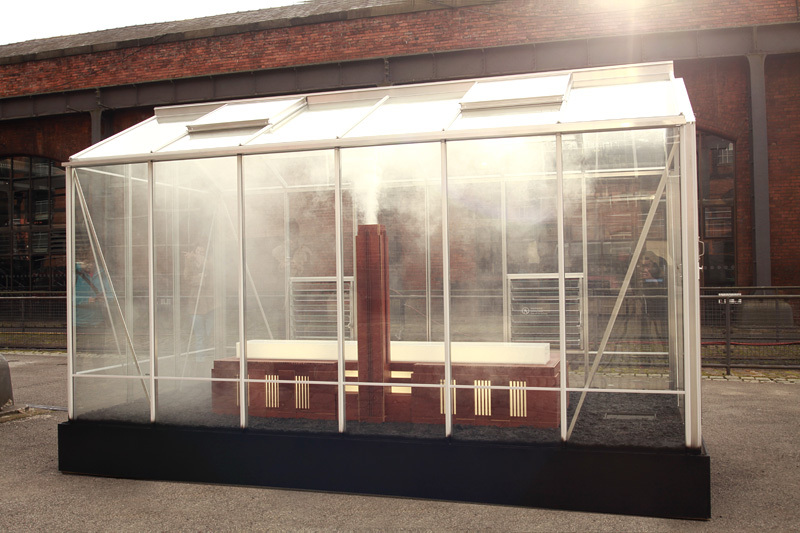 HeHe's projects use clouds as a visual metaphor to aestheticise toxin coated atmospheric emissions. 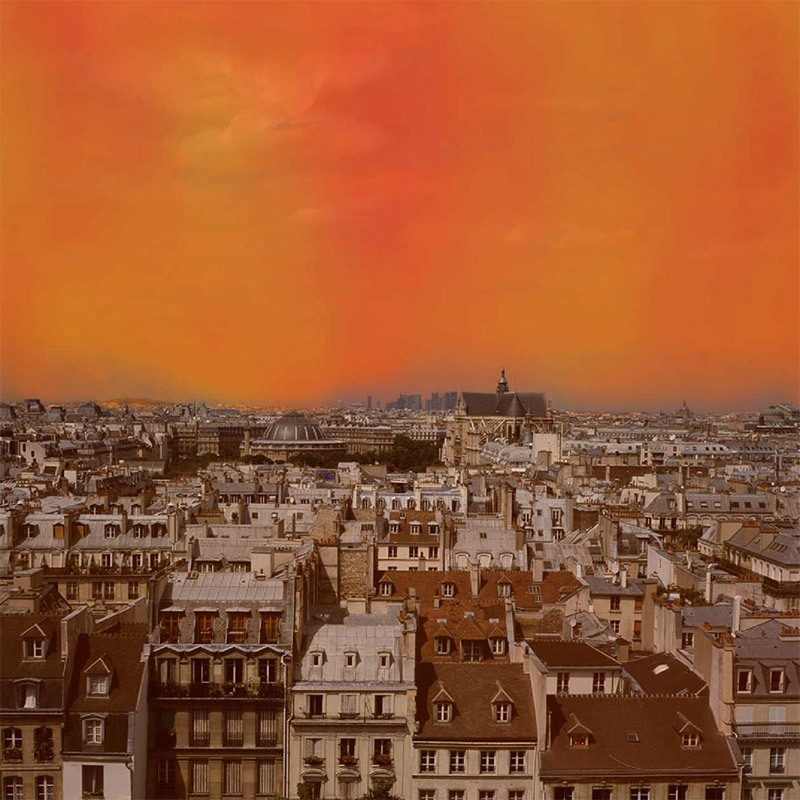 Smog, radioactive clouds, clouds produced by exhaust fumes, cigarettes or industrial emissions are visualised, highlighted, outlined, coloured or put under the spotlight, to alert us— not without humour—on our arrival in the Anthropocene age. 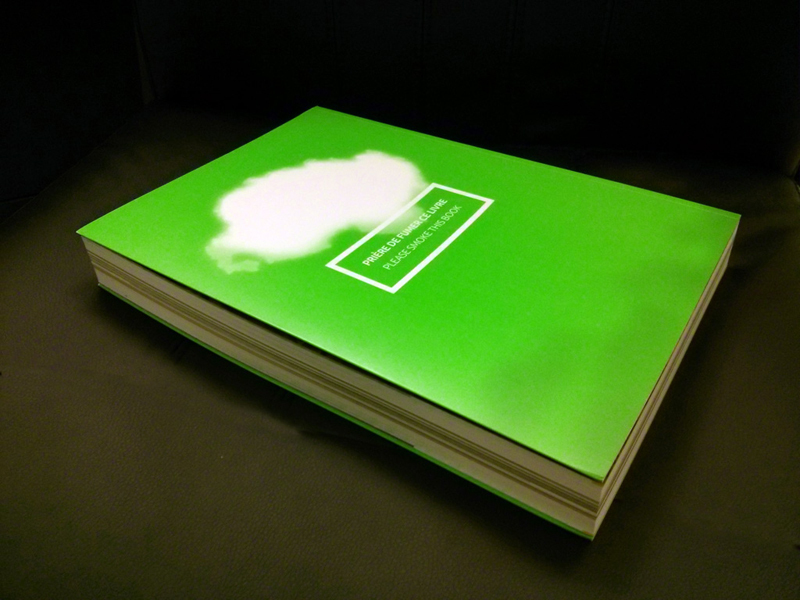 Of the fifteen projects shown and discussed in the book, the most ambitious and emblematic is Nuage vert (Green Cloud) which earned the prestigious Golden Nica at the festival Ars Electronica in 2008. 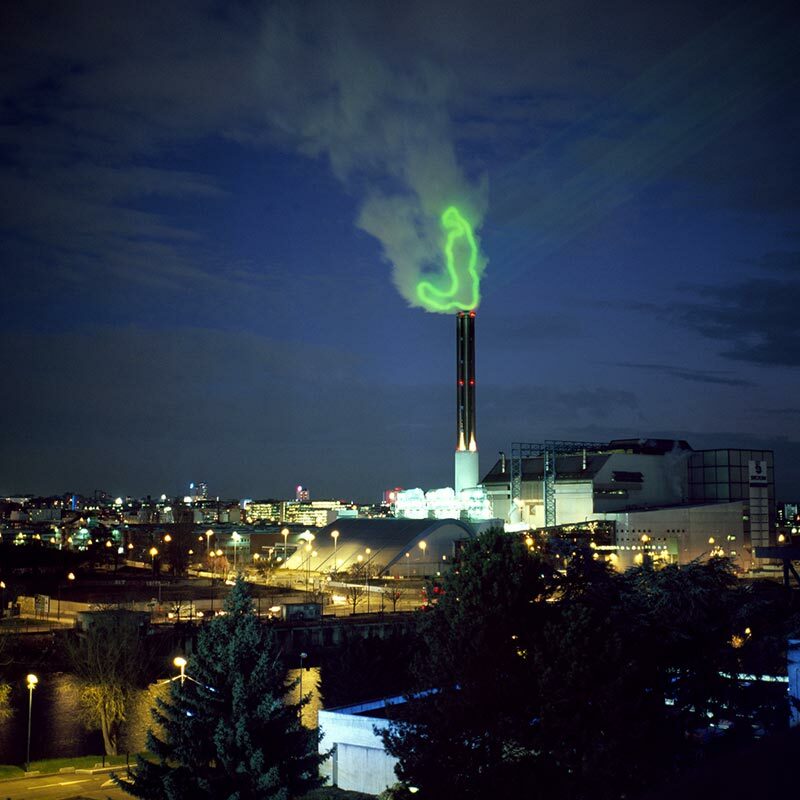 The book includes original documentation on the reception of Nuage Vert which sparked a political controversy when it was staged on a waste incinerator cloud in Saint Ouen (2009) and Ivry-sur-Seine (2010). Man Made Clouds is also a work of craft. Each book contains an ex-libris of smokeable paper, hand-made from 100% organic tobacco, specially cultivated in the soil of Pollinaria, Abruzzo, Italy. COAL vous invite à l’occasion de la sortie du livre Man Made Clouds de HeHe, à une séance de signature et de projection vidéos en présence des artistes et de Veit Stratmann à la REcyclerie. Cet évènement s’inscrit dans le programme du mois de septembre consacré à l’Allemagne et au Nucléaire de l’Europe de possible de la REcyclerie. Chaque mois, COAL contribue à cette programmation en présentant un artiste européen engagé. Les nuages occupent une place à part dans notre imaginaire ; leurs formes et combinaisons innombrables offrent d’infinies possibilités de métaphores. Dans la culture graphique, loin d’être des formes neutres, les représentations de nuages expriment véritablement une philosophie. Et pourtant, bien qu’on ait beaucoup écrit sur les nuages et malgré leurs fréquentes interventions dans l’art, le design ou l’architecture, rares sont les auteurs qui ont traité des nuages fabriqués par l’homme, de ces « man-made clouds » issus de notre société de consommation. Produits par les émissions industrielles, les gaz d’échappement ou la cigarette, les nuages artificiels façonnent un paysage chargé de multiples significations, d’un point de vue critique autant que social. Plus explicites en cela que les nuages façonnés par la nature, les nuages d’origine humaine semblent faits pour porter des idées politiques. Le présent ouvrage s’interroge sur la perception, la représentation et la phénoménologie propres à ces nuages d’origine humaine ; il tente de déchiffrer les multiples significations qu’ils peuvent revêtir. Le nuage « fabriqué », d’origine humaine, est au cœur de la société de consommation ; quand il se diffuse dans l’air, il constitue une manifestation flagrante de cette consommation. Mais dans la réalité quotidienne, ceux-là mêmes qui déclenchent de telles émissions les rendent souvent invisibles, par travestissement, par enfouissement ou par déplacement. Ainsi, la production industrielle et la consommation de ressources non-renouvelables s’effacent de la conscience collective. L’ouvrage explore le nuage en tant que métaphore, qui esthétise les émanations pour les placer dans le champ d’une vigilance critique. Ici, les nuages d’origine humaine sont surlignés et transformés. En déplaçant notre fascination pour les nuages naturels vers les nuages artificiels, nous les percevons – et nous percevons nous-mêmes – de façon différente. Le travail des artistes Helen Evans et Heiko Hansen (HeHe) dont il est ici question s’interrogent sur la relation indéfectible qui lie l’homme à son environnement. La notion même de nuages naturels, purs et propres, inaccessibles à l’humanité, appartient à un âge désormais révolu. 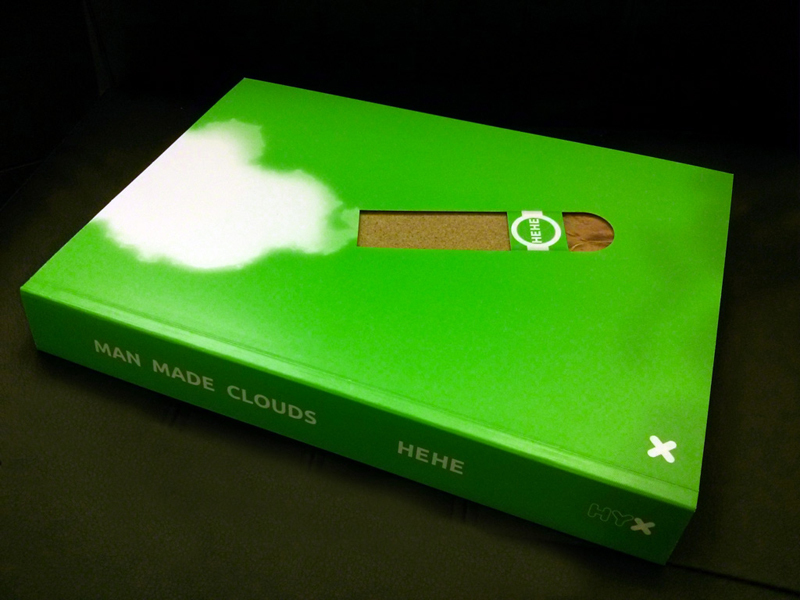 Man made cloud paraît aux Éditions HYX mi septembre 2016. 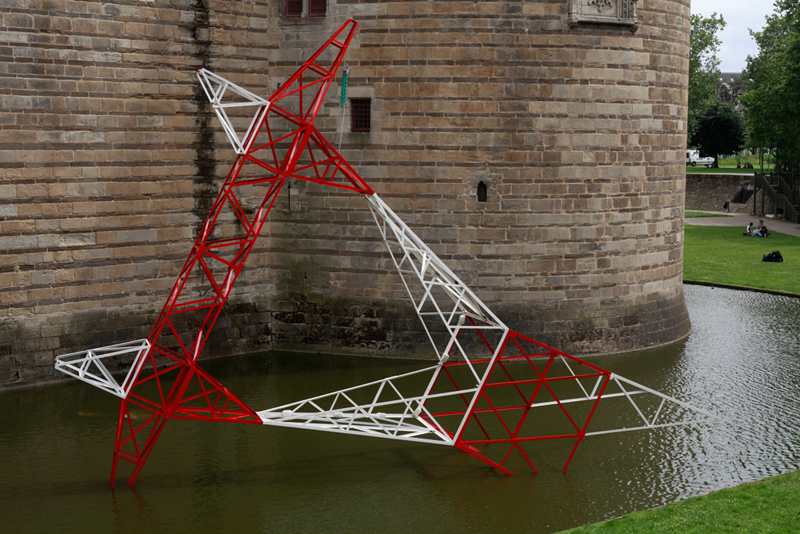 It’s as if this massive artwork fell into the castle moat. In this protected heritage sector, HeHe draws our attention to an infrastructure – a symbol of progress and collective energy - that is generally hidden in city centres. In a site where nothing appears to indicate an industrial or technological revolution has taken place, HeHe disrupts the idyll of the city and plays with time. Although the absurdity of the image will make you smile, one hopes it will also question the aesthetic, historical and heritage values we bestow upon monuments over time. With Undercurrent, HeHe incites us to reflect on the origins of our modern comfort and aspirations towards a sustainable city. HeHe use humour to subvert the implications and hidden dimensions of ecological threats and challenges. HeHe have devised site-specific personal rail systems around the world - including Tapis Volant in Istanbul, H-Line in New York, Metronome in Paris and M-Blem on the world’s first passenger railway line from Liverpool to Manchester. For Exoplanet Lot, HeHe have invented a new bicycle-train with a modular, science-fiction inspired design which you can see parked in this ‘station’ to explore the currently unused railway line which traverses this beautiful and dramatic landscape. 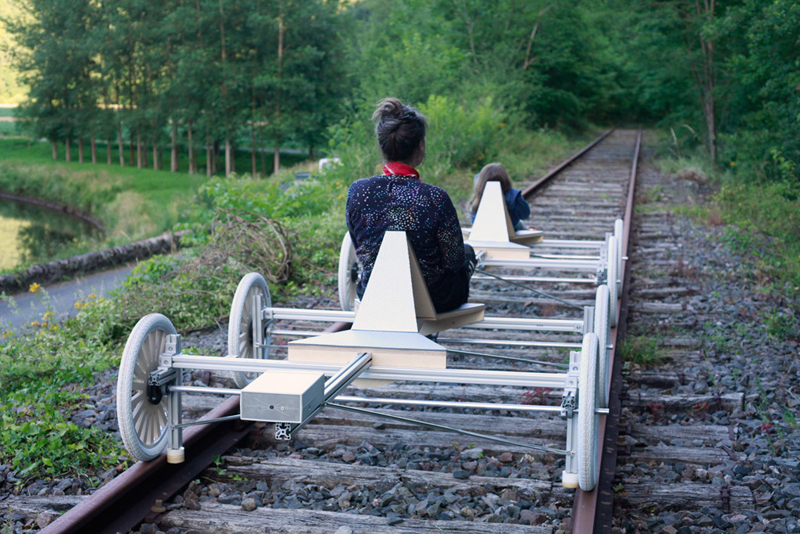 Centipede merges a futuristic artistic vision with rural regeneration: this autonomous multiple-driver vehicle might one day travel on both road and rail, sustainably. A particular atmosphere, invisible in a single image, can be sensed in the air of Bruges in the lingering smell of waffles, fries, carbonade and mussels. Daily trade is predominately food, cooked and consumed on site for the thousands of visitors to the city. There is a well disguised infrastructure making this possible: The aromatic air has to circulate, be guided, sucked away and eventually pushed out into the atmosphere. All that is solid must melt into the air. The Gentpoort, a former customs gate to control imports and exports, is now a symbolic threshold between the medieval city and the modern world outside. On its roof, two of the original turrets are missing. The forms of these two missing towers can be found in the sculpture installed in the grass. Made from spiral galvanised tubing, fused together as two half moons, it resembles a giant unpolished diamond. Inside the building a distinctive mood has taken over, literally inflecting the space with atmosphere. Artists participating in the exhibition are: Ackroyd and Harvey, Ant Farm, Brandon Ballengée, Leo Copers, Louis de Cordier (CosCo), Luc Deleu, Wim Delvoye, Mark Dion, Simon Faithfull, Nicolas Floc’h, Frans Gentils, HeHe, Rune Peitersen, Allan Sekula, Tuur Van Balen, Revital Cohen and Maarten Vanden Eynde. 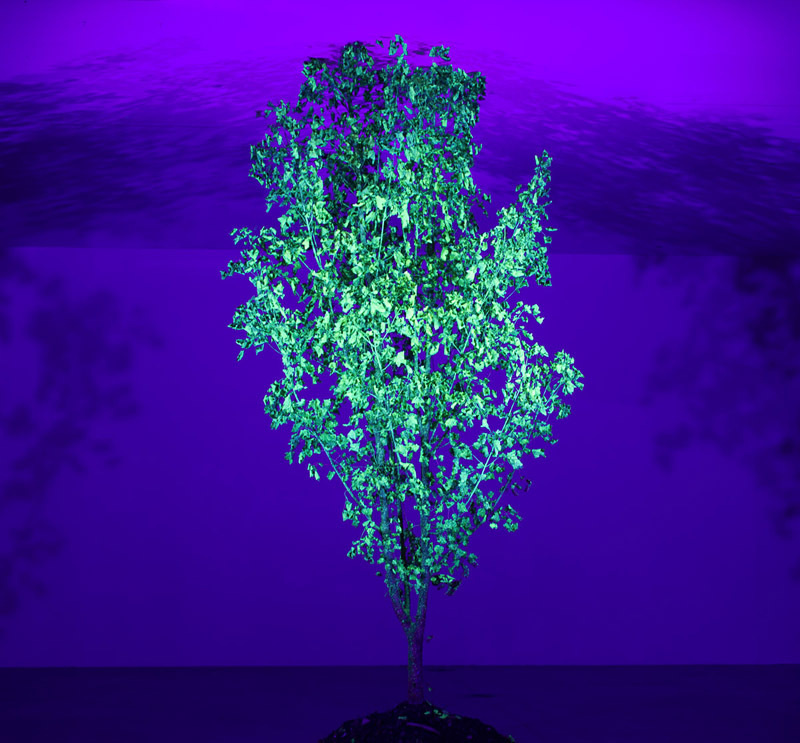 Radiant Tree at the Museum of Contemporary Art, Zagreb, Croatia during the exhibition The Forest Unbowed and Radovan Ivšić, Curator: Annie Le Brun and Snježana Pintarić and the Nuit Blanche Zagreb. 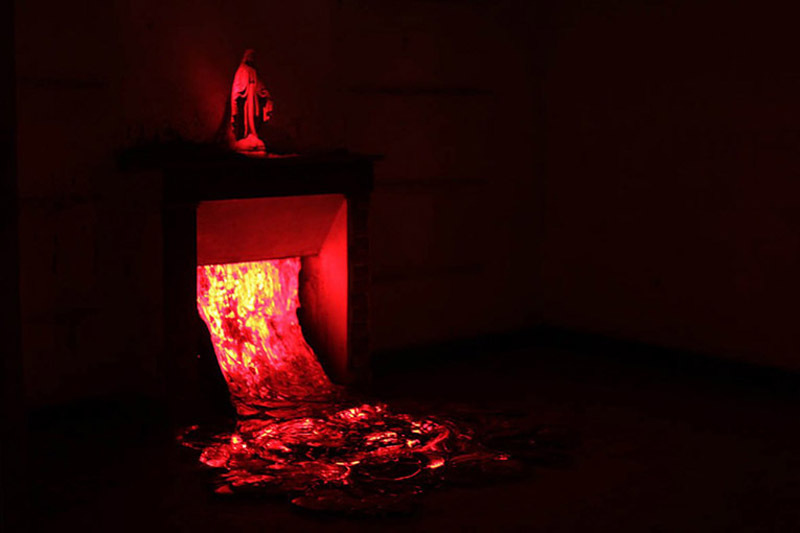 On the occasion of the Bruges Contemporary Art and Architecture Triennial 2015, eighteen artists created works that imagine a confrontation between a small, preserved medieval city and a 21st century megapolis. 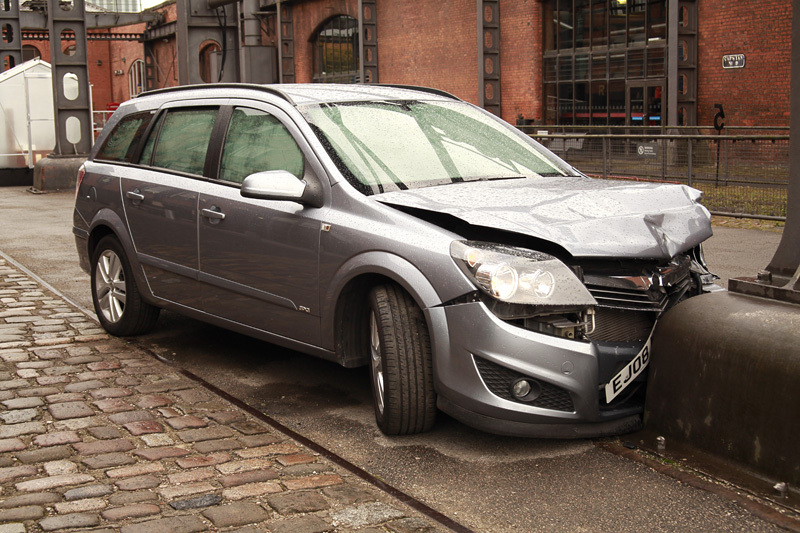 The German British artist duo HeHe makes this confrontation visible and audible. They placed a wrecked high voltage pylon in the canal at the Oud Sint Jan site, a place that exudes medieval atmosphere. 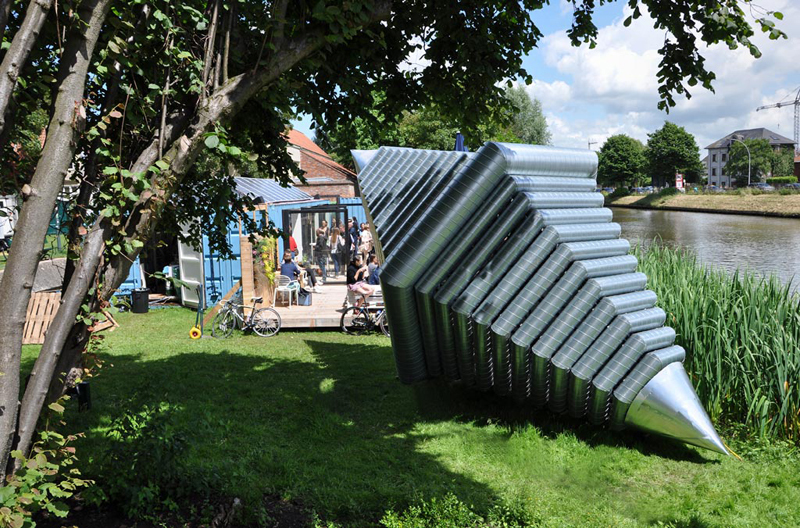 The crackling and flashing installation draws attention to the modern infrastructure that lies behind the idyllic, timeless image of Bruges. 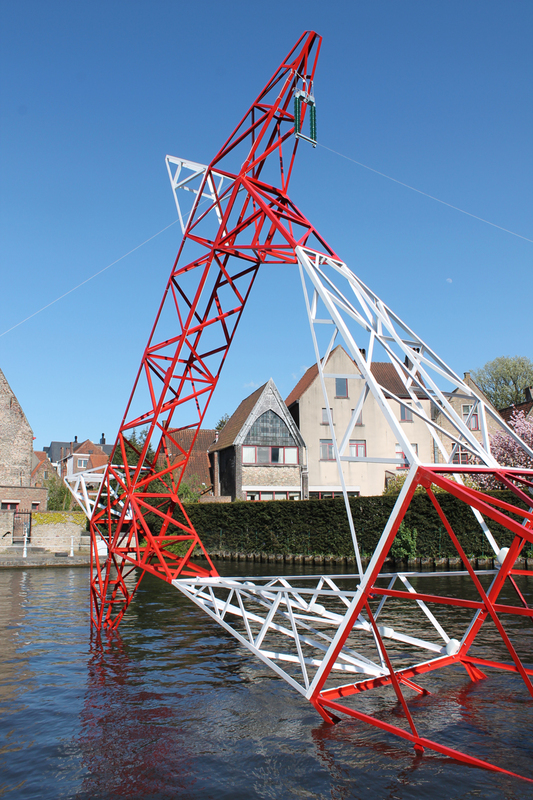 Undercurrent a large scale sculpture of modern technology in a setting of canals, stepped gables and horse drawn carriages: HeHe disrupts the idyll of medieval Bruges. Undercurrent triggers a visual and auditory shock wave in an environment where there are no signs of an industrial or technological revolution ever having occurred. The size of the steel structure contrasts with the small scale of the buildings and canals around it. The pylon emits electrical hums, hisses, ticks and crackles. Cables float on the water. At night, there are flashes of light. The seemingly archaic construction disturbs the image of the preserved old town. It tarnishes and it demands attention, just as the omnipresence of pylons in other environments disturbs the landscapes and lives around them. The floating pylon also prompts reflection on urban issues, such as energy supply and massive energy consumption, light and noise pollution, changing energy needs and the demand for cities to be sustainable. The high voltage pylon is a symbol of progress and collective energy. Does the fallen pylon refer to the end of utopian aspirations or to wasting energy? Or will it rise again from the waters? At the same time, this installation underlines the inevitability of signs of technology floating to the surface even in a city that is operated as a shiny, historical oasis. HeHe takes a lighthearted approach to examining aspects of transformation and energy transfer. 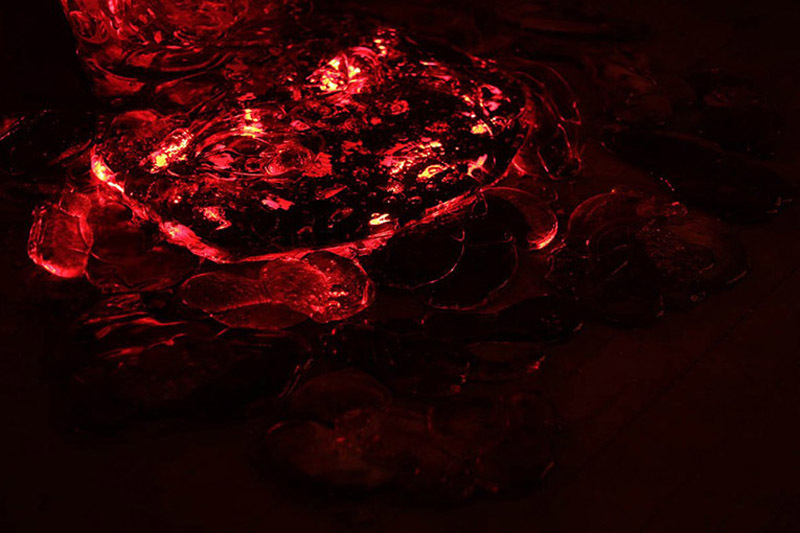 They frequently cause symbols and metaphors to converge with daily reality and they confront and expose the implications and hidden dimensions of ecological threats. Important to their work is the interplay between the microscopically small and the gigantically large: an example is electrical energy, itself invisible and yet generated by huge machines and distributed through highly visible networks. We then use this same energy to hide the gargantuan machinery. This paradox is alive and well in Bruges, an apparently medieval city where any reference to its electrical network is hidden or denied, while the city could not function without a daily power supply. By making this symbol of the invisible abruptly present on a stage where it cannot be ignored, HeHe creates an ironic commentary: a mass produced object becomes a curiosity in a city that counts on its preserved past to make it unique. 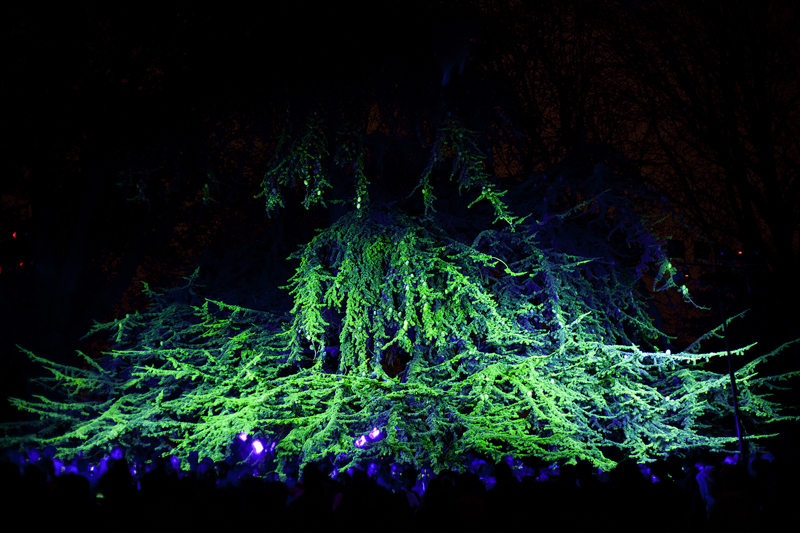 Radiant Tree, produced by COAL, Le Domaine départemental de Chamarande and Nuit Blanche 2014. 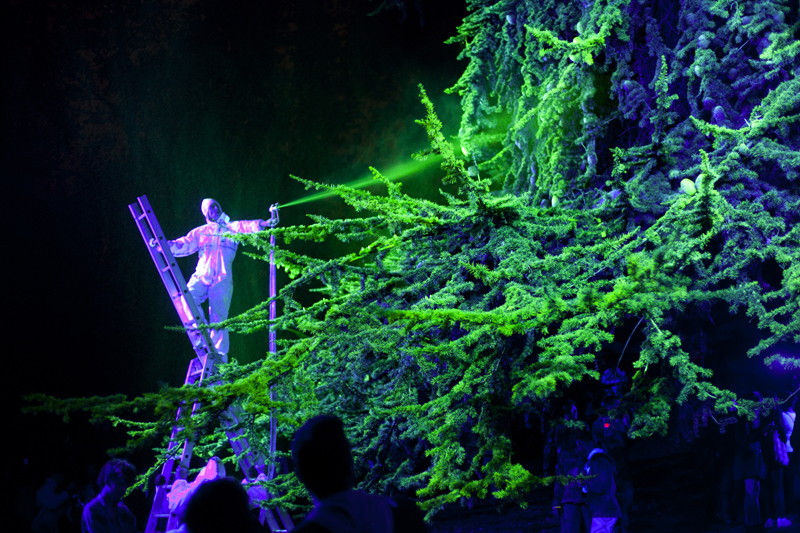 Radiant Tree in 2015 at the festival Orléanoïde in Orléans. Radiant Tree est un arbre ordinaire implanté dans un jardin public est transformé en une entité lumineuse éclatante. 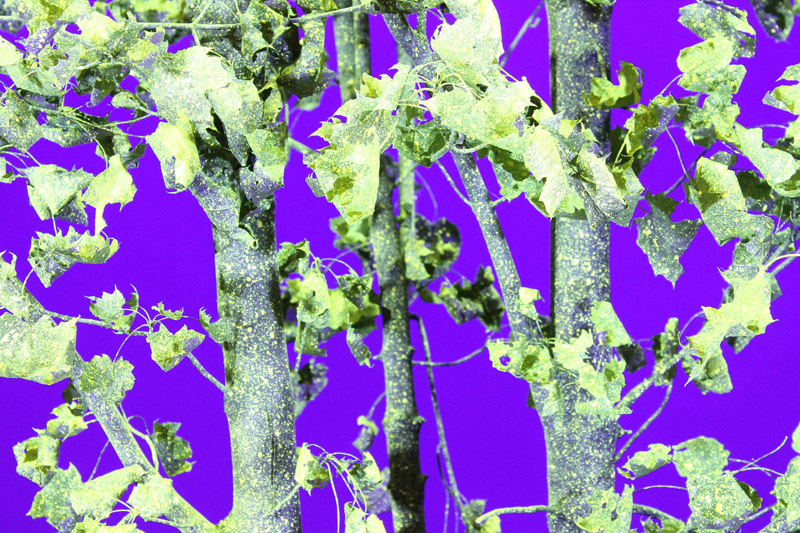 Mis en lumière par un éclairage ultra‑violet, le feuillage de l’arbre imprégné d’un fluide s’illumine dans la nuit. 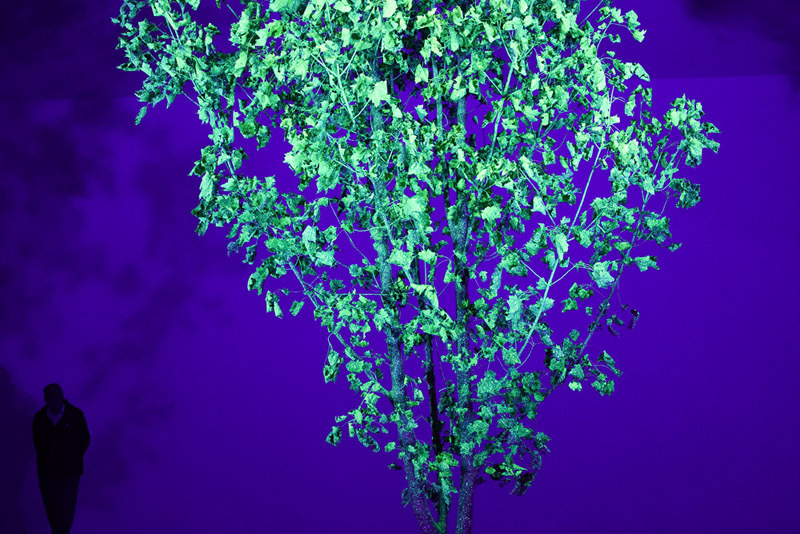 L’arbre vert fluorescent évoque la contamination de la nature par les polluants urbains, la radioactivité ou les technologies utopiques du futur tels les arbres bioluminescents dits « glow in the dark » dont la luminescence est rendue possible par la modification génétique. 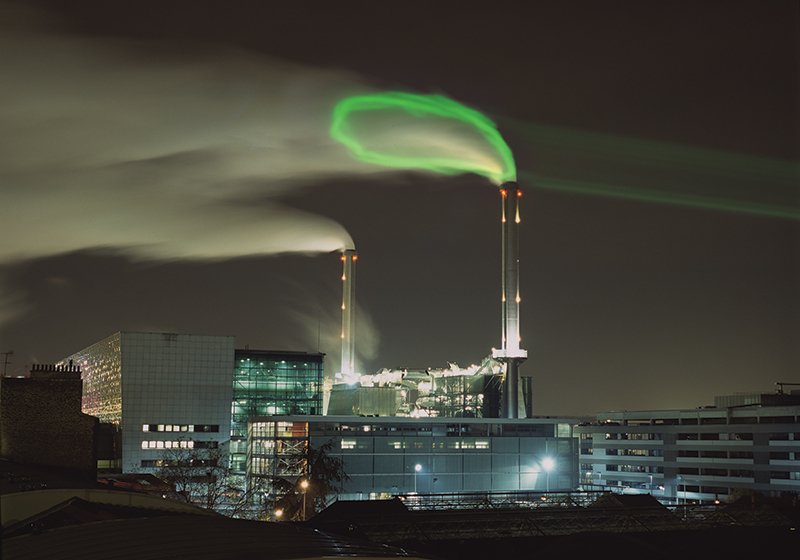 Cette couleur vert électrique est la couleur employée pour des expériences de pointe dans les nouvelles technologies, l’écologie et la toxicité. La métamorphose de l’arbre crée un espace imaginaire, ouvert à la contemplation, qui évoque la relation de l’homme avec la nature. L’œuvre active étrangement le parc, lui‑même espace artificiel et imitation de la nature, conçu pour que les citadins puissent expérimenter une forme de nature imitée et dessinée pour leur loisir. Artistic engineers HeHe have turned the gallery space into an experimental drilling site. 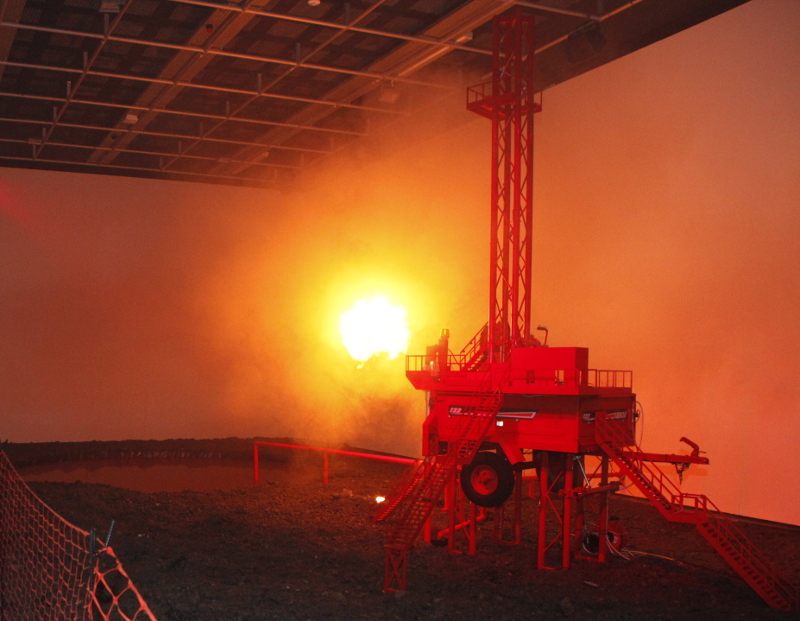 The environment of the gallery is transformed into an industrial landscape where boreholes are drilled and waste chemicals are treated. HeHe have begun initial exploratory tests to extract shale gas through an innovative process known as fracking. Fracking is short for ‘hydraulic fracturing’, a process of extracting gas by pumping a highly pressurised mixture of water, sand and chemicals underground. This opens fissures in subterranean rocks releasing the gas trapped several miles beneath the earth’s surface.